Yesterday, the 2015-16 Common Application went live, marking the unofficial beginning of the 2015-16 college application season. The Common Application is accepted by more than 600 colleges and universities, and sixty-nine new colleges joined the nonprofit consortium of schools for the upcoming year. The Common App was created more than three decades ago to simplify the application process by allowing students to answer a single core set of questions, including essays, for multiple colleges. Last year, 857,000 students submitted more than 3.7 million applications. 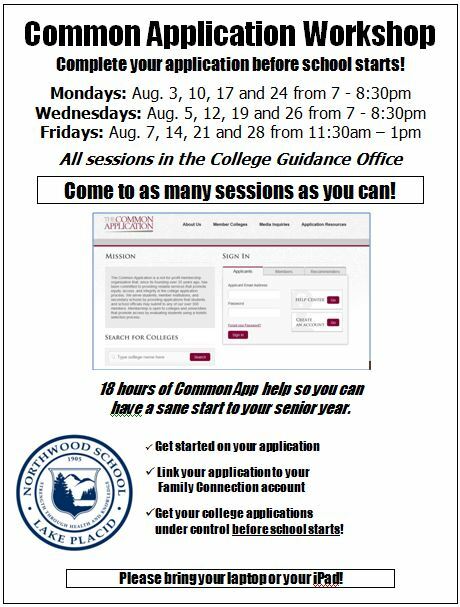 I encourage Northwood School students to get started on their Common App; however, do not submit an application until it is reviewed by your college counselor. We also suggest you never upload an essay into the Common App until it is complete. Download this tutorial to help you with your Common App. Use this worksheet to keep track of your goals for August.